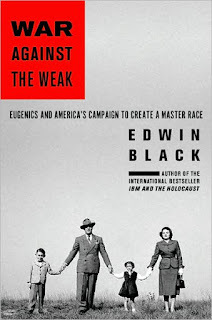 War Against the Weak: Eugenics and America's Campaign to Create a Master Race. Edwin Black. Dialog Press. 592 pages. The promise of controlling natural biological phenomena affords endless opportunities for commerce. Biotechnology and genomics will most certainly play a huge role in the future of business. But some people are deeply concerned with the morality of manipulating these processes, fearing that the presumed objectivity of science will inevitably be tainted by human ignorance and bias. These fears are serious and not without foundation, especially when placed in a historical context. When technology and biology intersect, there's a danger that the profit motive is one of the least objectionable forces that come into play. In his previous book, IBM and the Holocaust, Edwin Black demonstrated how early computer technology enabled Hitler's ''final solution.'' Now Black, aided by a small army of researchers and scholars, uncovers the roots of the Nazis' obsession with racial purity and their devotion to the Nordic ideal of blond hair and blue eyes, a notion popularized in the United States, not Germany. But the effects weren't just cosmetic. Writes Black: "Throughout the first six decades of the 20th century, hundreds of thousands of Americans and untold numbers of others were not permitted to continue their families by reproducing. Selected because of their ancestry, national origin, race or religion, they were forcibly sterilized, wrongly committed to mental institutions, where they died in great numbers, prohibited from marrying and sometimes even unmarried by state bureaucrats. Eugenics was derived from the work of such scientists as Charles Darwin and Gregor Mendel. It was further refined by the studies of Francis J. Galton, a 19th-century Englishman with an insatiable curiosity about all aspects of human life and behavior. Galton — who introduced the use of fingerprints in criminal investigations and charted the first weather maps — coined the word ''eugenics'' to describe his studied pursuit of the quantification of human heredity and behavior. According to Black, Galton had not quite put together enough science to back up the theories, but his ideas later found fertile ground in the New World. Many Americans showed great enthusiasm for Utopian ideals, among them the curious notion that racial purity was highly desirable. The America of the late 19th and early 20th centuries had begun to experience an influx of immigrants from Eastern and Southern Europe — immigrants who were decidedly not Nordic. Eugenics fit neatly into these settlers' growing xenophobia. Black chronicles the rise of eugenics and its marriage to racism in America and its subsequent adoption by a young German corporal. Adolph Hitler, in fact, studied several American eugenics texts while jailed for participating in mob action in 1924 and even penned fan letters to the authors. War Against the Weak is hardly escapist fare, though Black's prose makes a difficult subject matter far less tendentious than one might expect. As we consider the commercial possibilities afforded by gene mapping, cloning and the like, this book should be required reading for leaders seeking to avoid the inevitable penalties bestowed upon those who fail to learn the lessons of history.